The history of Wooden Smoking Pipes tells a unique tale. Wooden smoking pipes have been without a doubt one of the biggest traditions in many cultures. Europe in particular seems to have some of the deepest historical evidence for wooden smoking pipes. For example, wooden smoking pipes are known for complex designs in Czech Republic. The history of Czech wooden smoking pipes runs deep, as large annual farmer’s market had pipes for sale for hundreds of years. They were usually made by local artists from nearby available materials. The most commonly used wood was from the Alder and Red Ash; however Walnut, Birch, Plum, Pear and Lime-tree were used as well. The founders of the pipe-making tradition in Prosec were Anton Pesina and Philip Svec, who started the mass production of pipes. Initially pipes were made on hand-driven treading lathe, and later on machinery with electric power. More recently, the production of quality wooden smoking pipes is localized to four main areas around the world, which are made mainly for export. Italy is the largest producer, and has a large selection of products and abundant regional resources. The largest company is Savinelli from Milan, established in 1876. The advantage of this company is a wide variety of shapes that are slightly different from classical English shapes. The second largest producers are in France, mainly in the southern town of Saint-Claude, where there is a whole line of known companies that have been making pipes for decades. French wooden smoking pipes were very popular before and after the First World War. At the beginning of the 20th century, many English men smoked only these French pipes. The thirst largest area producing wooden smoking pipes is Great Britain and Ireland, where we could hardly imagine a Celt without a pipe. It was these Englishmen who made the short classic pipes so popular around the world. English pipes stand out for their quality, and despite their conservative shapes are still much sought after. There is evidence of extremely old wooden smoking pipes found in Ireland as well. Wooden smoking pipes for tobacco typically consists of a small chamber (the bowl) for the combustion range from the very simple machine-made briar pipe to highly-prized handmade and artful implements created by renowned pipe makers which are often very expensive collector’s items while others are carved atypically giving them a native appeal. 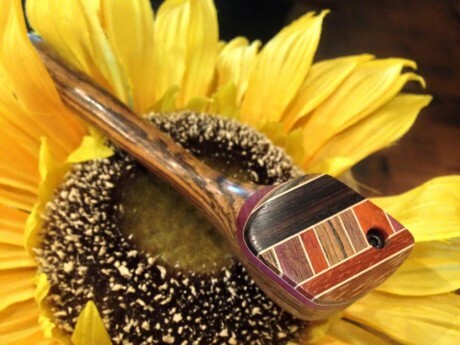 Here’s just one of our favorite wooden smoking pipes we offer at Sunflower Pipes Smoke Shop.